A virus is a small, nonliving particle that invades and then reproduces inside a living cell. Viruses are nonliving because viruses are not cells. Viruses also cannot make food, take in food, or produce wastes. Viruses can only multiply when they are inside a living cell. A host is a living thing that provides a source of energy for a virus or an organism. Organisms that live on or in a host and cause harm to the host are called parasites. Almost all viruses act like parasites because they destroy the cells in which they multiply. All viruses have two basic parts: an outer coat that protects the virus and an inner core made of genetic material. A virus's genetic material. A virus's genetic material contains the instructions for making new viruses. The coat of a virus plays an important role during the invasion of a host cell. This coat is made of proteins. 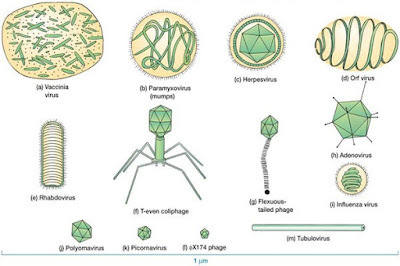 Each virus contains unique proteins in its coat. The shape of the proteins allows the virus's coat to attach to, or lock onto, certain cells in the host. After a virus attaches to a cell, it enters the cell. Once inside, a virus's genetic material takes over the cell's functions. The genetic material directs the cell to produce the virus's proteins and genetic material. These proteins and genetic material are then assembled. After entering a cell the virus's genetic material takes over the cell's functions, and the cell quickly begins to produce the virus's proteins and genetic material these parts assemble into new viruses. When it is full of new viruses the host cell bursts open and releases the new viruses. Virus's genetic material becomes part of the cell's genetic material. The virus's genetic material may stay in this inactive state for a long time.